Recently I went out and shot an automotive self assignment. 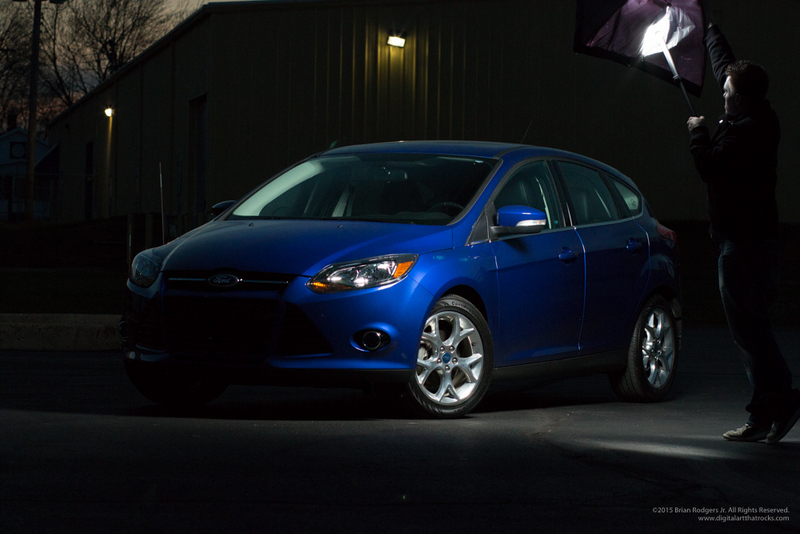 The subject: a Ford Focus Titanium. I think the overall design of the car speaks volumes over it’s predecessors, and I really wanted to capture that in this composite image. I cannot stress enough that self assignments are worth your time. You need to shoot for yourself, not just for clients. It’s the only way you will ever bring out your true vision as an artist. The Studio: I used an empty parking lot as my studio for this shoot because I knew that I wanted to build a composite shot of the car in some kind of scene, at the time of shooting, I had no idea what that scene would look like. Composition: The composition for this shot was so important! I can’t stress that enough. If you want to get a professional commercial automotive shot, it starts with the composition. I suggest looking at a lot of commercial automotive photography for inspiration. Look at where the light falls on the vehicle. Notice that this front 3/4 shot of the vehicle shows off the design of the car? Notice the interior details? The Lighting: I used natural light for the most part. I paid very close attention to where my light was falling on the vehicle. Notice that beautiful horizon line that paints the landscape on the side of the vehicle? How about that beautiful light that kisses the hood of the car? That was completely intentional. You really have to pay attention to the details on a shot like this. If the car had been positioned in a different direction, the light would have looked completely different. I used a speedlight to light the interior of the vehicle ever so slightly. Even though this shot is primarily an exterior, It’s important to show some interior detail as well. Here is a behind the scenes image of me light painting the vehicle as the sun started to go down. Composite side notes: Notice that the background light matches the light on the car? When looking through your library of backgrounds, keep that in mind. Look at the overall direction of light. Also, I knew that when building this composite image, that the foreground would work to my advantage. I had a little cleanup to do on the pavement, but I didn’t have to go out and shoot separate pavement and build a new shadow for the car. I used what I had shot, defined the horizon line of the image, and composited in a background that I thought fit the car. For this shot, I wanted to convey traveling in style. If this image makes you want to to test drive this car, and possibly buy it, this image has served it's purpose. Brian Rodgers Jr. of Digital Art that Rocks featured on the popular web based photography show "The Grid" Check it out at 35:12 & 1:03:15 mintues into the show!